ICF Accredited for up to 65 ICF ACSTH or CCEU's. Prerequisite - Passing of Associate Power Coach� (APC) exams (or with special permission form the CLI Director of Training). Offered via 33 Distance Learning webclasses. Learn the intricacies of writing belief systems with your clients and anchor the new beliefs for permanent positive behavioural change. 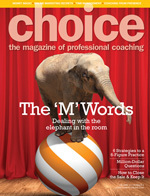 At least 15 full session coaching methodologies to enhance your Coaching Mastery. These include CLI's Career Transition System and integration of Mind-Kinetics� into your Free Fly Coaching and Mentoring Conversations. Successful completion of the written and oral exams are required to achieve your CPC certification. CPC achievement marks the 'half way' point in your training to become a Professional Certified Power Coach�. Prerequisite: Certified Power Coach� Designation. Learn and practise advanced coaching methodologies. Learn one of the best Self-Coaching tools, assist your clients in removing their largest mental block in life and master the use of 14 Power Coaching methodologies which balance mind, body and spirit. Oral exam. "Removing Multiple Blocks to Success"
The only word to describe this curriculum is �astonishing�! The PCMK� methodologies learned are truly life-changing and you will be a brilliant Coach. For example, one of the greatest gifts we can give our clients is the ability to think bilaterally � to switch easily between left and right hemispheres of the brain. The benefits are numerous including greater innovativeness, faster thinking, feeling more peaceful and content inside and greater productivity. With this designation Coaches deepen their study of the mystery, complexity and beauty of the human mind. Imagine helping your Clients discover and remove the biggest boulder on their shoulder stopping them from living a successful life! This is powerful coaching. Clients will usually seek out a Coach when they discover that a way of thinking they have had all of their lives is no longer serving them. SCPC students learn the top fears that people have and how to put them behind us. We learn how to help a client assess their brain's capacity to provide them with the success they desire. For example, transposed hemispheres may be causing the client to think too hard! Intuition: our greatest coaching skill. How to build it. How to maintain it. The Secrets of Life: embracing it, loving it and letting go of attachments. The tools and instruments learned in SCPC allow a Power Coach� to greatly deepen their intuitive ability. We learn to put a name to the various stages of thinking and recognize when and how to pull us in to "higher mind". In addition to the PCMK� methodologies listed for the CPC designation, you will learn these high powered ones to help your Clients understand how they think and why! The Brain Walk� - 'Pentalateral Thinker'. The PCPC is a greatly coveted designation. You can consider yourself to be among the best in the industry because your knowledge of mind, body, spirit mastery as it relates to Coaching will bring you the most fascinating (and challenging) Clients. With the PCPC you will be prepared for them. The PCPC Coach is able to work with the Client to put together a plan to assist them in functioning well on all four levels: emotionally, mentally, spiritually and physically and in both their personal and professional lives. This Coach has a deeper understanding of how our physiology affects our psychology and vice versa. Science has proven that "what we think" is "what we become in our body". Awakening our clients to the power of our thinking and how it affects our own body is a necessary discussion as a Whole Life Coach. Power Coaches may find themselves working with whole families. Children take on their parent's patterns, good and bad. They experience the same joys as their parents and they can experience the same pain. Children respond quickly to Mind-Kinetics� work. By working with the whole family, a Coach can assist them in coming to a place of greater harmony. This is truly rewarding work. Letting go of attachments to a person, place or thing. In addition to the PCMK� methodologies listed for the CPC and SCPC designations, you will learn these additional sophisticated ones to help your Clients understand how they think and why! The Coach learns in-depth processes for assisting couples and groups of people to move past roadblocks and achieve their goals. ** If you have your Certified Executive Power Coach� Designation, then upon your successful passing of the PCPC exams, you may call yourself a Professional Certified Executive Power Coach�. a.) demonstrated a high level of proficiency at one-on-one coaching. b.) exhibit the confidence to move into coaching groups. c.) successfully completed their APC level exam. In Distance Learning (DL) webclasses learn 'Simple Group Coach' and how to use all of your Mind-Kinetics� methodologies when Coaching Groups. Group Power Coaching� is absolutely astonishing because you will have the ability to coach couples, families, whole teams and other groups. DL hours: minimum of 7 classes x 2hr = 14 ICF ACSTH. One class per week. Note: Actual number of classes determined by number of registered students. Learn Highly Sought After and Unique Executive Leadership Tools! and Unique Executive Leadership Tools You will Learn. Successful completion of your (CPC), Certified Power Coach� Program. Removing Multiple Blocks to Success"